If you are a proud owner of an iPhone 3GS, iPhone 4, or an iPhone 4s and you purchased your device between October 2009 to September 2012, then you might want to go ahead and take a look at the model number of your charger. If it happens to be A1300 and the "CE" letters are painted solid gray, then you are eligible for a charger replacement, as your charging accessory could overheat and pose certain safety risks. On top of it all, the A1300 charger got sold separately, as well, which means that there are probably millions of faulty iPhone chargers out there. Literally. 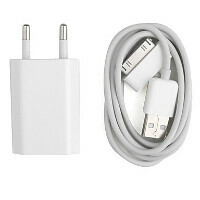 Still, Apple will replace said chargers for free and will provide the affected users with redesigned adapters. The replacements come with the A1400 model name and the "CE" letters are only outlined in gray. In order to exchange a faulty adapter for a safe one, you need to take it to an Apple Retail Store or an authorized Apple Service Provider. Your iPhone serial number will have to be verified, too. Apple says that the A1300 has been on the shelves in Albania, Austria, Belgium, Bulgaria, Croatia, Czech Republic, Denmark, Egypt, Finland, France, Germany, Greece, Hungary, India, Indonesia, Israel, Italy, Latvia, Lithuania, Luxembourg, Macedonia, Moldova, Montenegro, the Netherlands, Norway, Poland, Portugal, Romania, Russia, Slovakia, Slovenia, South Africa, Spain, Sweden, Switzerland, Turkey, and Vietnam. Are you among the affected users? this is the power of APPLE. Apple world where anything is possible. "between October 2009 to September 2012" Kudos, Apple. They should just replace those faulty iPhones instead!! You know your iphone charger is about to die when it wears a turtleneck. iPhone chargers only last three month at max, so why would I keep the one I got back in 2009/2012? If this is true....the distortion field really is strong. I got phone chargers from 2010 that still work. Kudos for Apple for this....but its just another chapter in Apple isnt prefect.